St Clare Hospice is calling on local people to help us improve the lives of others through our growing community-led social connection programme, Compassionate Neighbours. The award-winning programme, originally founded by St Joseph’s Hospice in East London in 2011, has now been established in a total of eight hospices across the UK. St Clare is using the Compassionate Neighbours project to tackle social isolation and loneliness for those living with a life-limiting illness throughout West Essex and East Herts. However, this relies on the support of local people to give an hour a week towards helping others in the community. These generous volunteers regularly offer their time, companionship and a listening ear to their matched Community Members. The project at St Clare has successfully recruited 47 Compassionate Neighbours and is currently on-track to reach its ambitious target of recruiting 64 volunteers by the end of March 2019. St Clare Hospice is calling on caring members of the public from the Uttlesford District, Bishop’s Stortford, Sawbridgeworth, Harlow and Epping Forest areas, to come forward and join the ranks of our volunteers. Harry Weldon (from Harlow) has already benefited from the project. 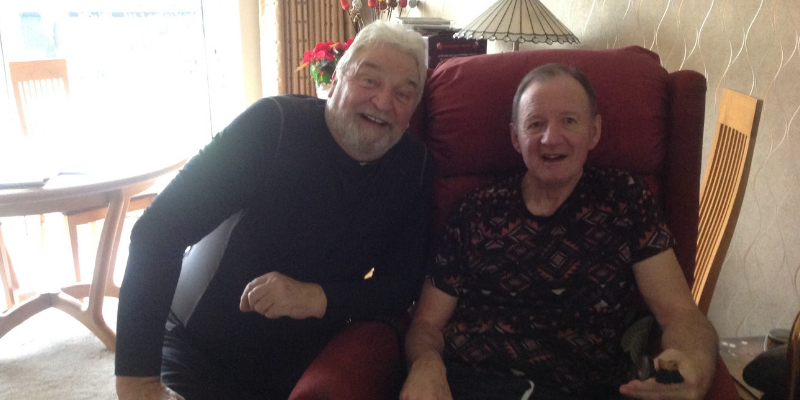 He meets weekly with his Compassionate Neighbour, Dave Austin (from North Weald), during which time the pair enjoy spending time together at Harry’s home or out in local community. Harry first encountered the compassionate, supportive environment at St Clare Hospice when he was attending a Day Therapy group. The following year he was told about the Compassionate Neighbours project at and asked if he’d like to try it. The Compassionate Neighbours programme has also helped Harry to do things without Dave. New volunteers will be provided with a full training programme, free of charge. The training courses are informal, fun and inspirational, giving volunteers the opportunity to explore how they can use their compassion to help others and give them the confidence to support people in their community. Please note that you must be over 18 to volunteer for this service. St Clare Hospice will carry out a relevant DBS check and you must be willing to give up your time on a regular basis.